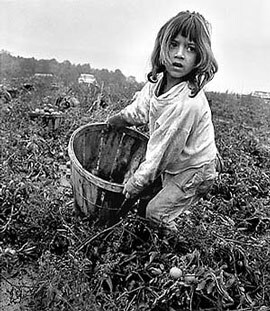 A Mexican-American migrant girl works in a tomato field in Indiana in 1968. Photo Courtesy of Ed Breen. Although American farms are highly mechanized, they still require quite a bit of human labor. Children who live on farms are generally expected to help with farm work in their own families, and they also sometimes earn money by helping other farmers in the area. Such work might include operating farm machinery, feeding farm animals and cleaning their living areas, milking cows, collecting eggs from chickens, putting up hay, and harvesting other crops. There are special regulations to protect children who do farm work. Ten and 11-year-olds may work on farms owned or operated by their parent, or with a parent's written consent. They have to work outside of school hours in non-hazardous jobs and they do not have to be paid minimum wage. Twelve and 13-year-olds may work outside of school hours in non-hazardous jobs, either with a parent's written consent or on the same farm as the parents. Fourteen and 15-year-olds may perform any non-hazardous farm job outside of school hours. Sixteen year-olds and older may perform any farm job, whether hazardous or not, for unlimited hours.